Nilaga is so simple and yet soooo good and nourishing. There's something comforting about it, whether you're being served the soup to relieve your fever, or enjoying it on a rainy afternoon, or just simply sharing it with your family over dinner. I guess it's because a lot more time is needed to make wonderful nilaga than the usual dishes to ensure that the meat is tender; the extra effort expended makes it a special dish. 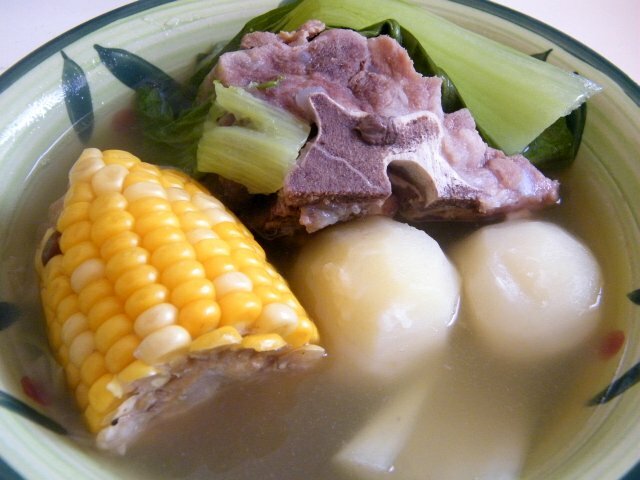 Nilaga basically means "boiled", and the main meat ingredient is either beef or pork. For this recipe, we used pork with some bone in it. 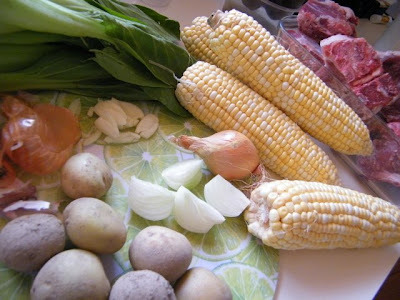 Nilagang baboy is also quite unique in its other ingredients because you can add corn on the cob and banana plantain! Too bad we did not have cooking bananas at this time, it would have been the most complete nilaga ever. But you can skip this or the corn on the cob if you do not have these. This recipe takes around an hour to cook, and is good for 6 persons. Place 1.5 pitches of water in a deep pot, toss in the ginger, onion and garlic, and bring to a boil. This ensures that early on, the flavours of these spices are absorbed by the water. When the water is boiling, put in the pork pieces. Grind a generous amount of black pepper into the water, and sprinkle salt (about 1 tablespoon for starters). Cover the pot over medium heat. When the water starts boiling again, add the corn and cover. In case you see scum floating on the water, remove these. 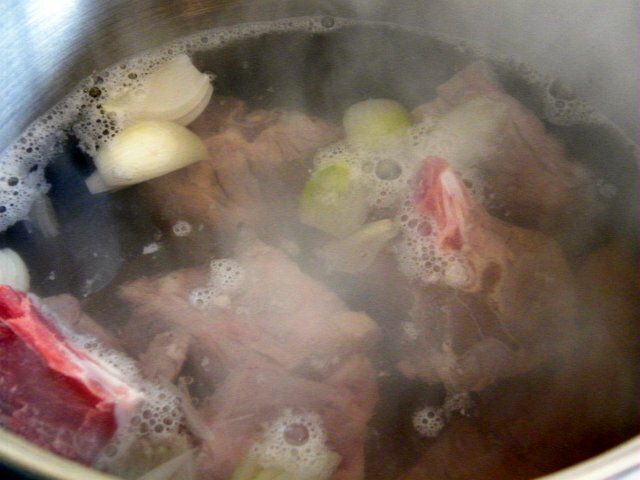 The pork should be soft enough to be pierced with a fork without much effort 40 minutes after placing the pork in the boiling water. At this point you can also taste the soup and see if it needs more salt and pepper. When the pork is tender, add in the potatoes and cover. Avoid stirring at this time because the potatoes can disintegrate when cooked. Five minutes after placing the potatoes, turn off the heat. After 5 more minutes (or less, check when your potatoes can be pierced by a fork with a bit of resistance, we do not want overcooked potatoes), place the pechay leaves on top and cover once again for a couple more minutes just to cook the leaves. Serve in a big bowl, with smaller bowls to go around for diners to pour in their own wonderful soup of goodness. Nilagang baboy also goes well with patis (fish sauce) as dip. This is my kind of meal! I'll have to try making it with banana like you said. We get plantains here, none of the saba like we have back home, but probably close enough. JMom: I love saba in nilaga. Try it! Yeah pwede na rin ang plantain. 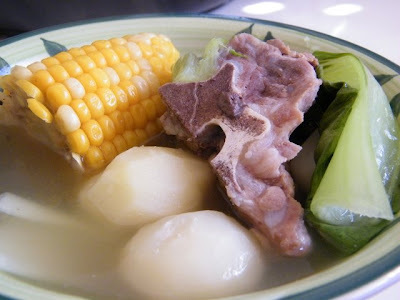 I love Nilaga! Been a long time since I've treated myself to one. I don't eat it with banana though, just with potatoes. Maybe it's because I'm not a fruit person, that's why.